As I look back on the previous year, the best way I can describe 2014 was that it was the year that I found my voice. When I finished college, I found myself feeling very lost. For most of my life, my dream was to go to college, but once the whole college experience ended, I found myself without any job offers and most of my friends were getting engaged or married or having children. It didn’t help that I lost a dear friend who was with me from the beginning of my college years. He was a retired teacher, a pastor that I often had lunch with, and he passed away of old age. Losing him around the same time I graduated college made me feel like I was completely losing everything I knew about myself. When 2013 started, I also lost another friend who turned out to be a toxic influence and most of the year was spent making new friends outside of the safety of a college campus and the internet. When 2014 came around, I started taking more positive risks. I started this blog and took pictures of what I was grateful for everyday. I participated in a poetry-a-day-challenge. 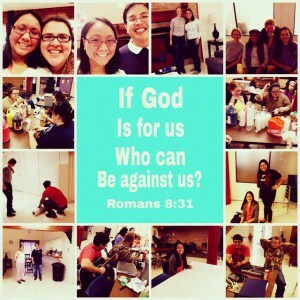 I volunteered at an Awakening retreat in March and taught Sunday School at my local church. I had the opportunity to travel. I won’t sugarcoat it and say that 2014 was perfect, but it was definitely of the good, at least on a personal level for me. When I think about what it meant for me to find my voice in 2014, I think of 2 events: the first was Comicpalooza, where I met the cast of Buffy and got to ask them questions at the panel. It wasn’t a picture-perfect moment, but it was pretty close to it because I spoke with confidence, even amidst my girlish giggling. The second event was me giving testimony at the September Awakening retreat. I gave my speech with just my voice, no microphone necessary. I talked about how the friends I made during Awakening became the community I needed to have after finishing college. Keep in mind, by the way, that during both moments, I stood in a large room in front of a lot of people. The days of me taking anxiety medication are long gone now. Visit some convents. I’m currently interested in meeting the Daughters of St. Pal. Travel to more places outside of Texas. I especially hope to go to Philadelphia for Pope Francis’s first visit to America. Write 700 words a day for 50 days to finally finish the 2nd (or was it 3rd) draft of my novel. Read at least 12 new books by reading at least 1 book every 2 weeks. Lose 5lbs every week by snacking less and going to the gym and/or taking a 30 minute walk at least 3x a week. Keep updating my gratitude journal by listing at least 3 things I’m grateful for every day. Update this blog at least once a week. Learn how to drive by taking classes in the next few months. Increase my prayer life by praying the Rosary and Examen daily and the Liturgy of the Hours at least once a week. Finish 3 new knitting projects and, if possible, be able to knit presents for everyone for Christmas 2015. Here’s to the new year, y’all! November was a month that I really appreciated the friends I had. Back when I was younger, I always had this idea that in high school and college, I would have friends that I could hang out with all the time. Then, when I was about to finish college, I learned that real friendships, just like romantic relationships, need boundaries in order to stay healthy. It wasn’t until I reached out of my comfort zone (and the internet) and started volunteering that I found the best friends a girl could ever ask for. These are the kind of friends I can call up about almost anything. The friendships I have with these people started with a shared faith, but it was also based on shared experiences as volunteers. We don’t agree on fandom related things, but we do agree on things we consider most important to us. So even though November (and Thanksgiving) is centered more around family, I want to honor the metaphorical family I found. My brothers and sisters in Christ. The best friends I could ever ask for. The month of October usually consisted of 2 things: 1) Prepping for Halloween and 2) watching lots of scary movies. But this year, Taylor Swift took over with the premiere of her latest album, 1989. I already went into detail about how I obsessed over Taylor Swift ever since her first album came out. And lately, it seems like each song from 1989 has been applying to things I’m experiencing now or plan to do in the future. Today, I wrote my first song and I listened to some of the tracks to get the bridge done correctly. And like Taylor Swift, this song was inspired by love. All I need now is just to set it to music. make me happy once again? 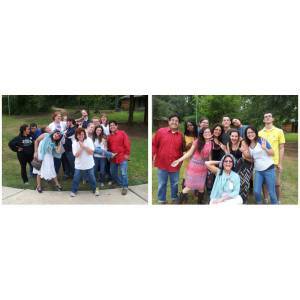 The first half of September was spent getting ready for the young adult retreat, Bayou Awakening. I was part of a more behind-the-scenes staff, but I also gave my first retreat talk. It’s hard to believe that in 2013, I went to Bayou as a retreat attendant and now I devote my time as a staff member. Something I learned was that even before I even thought about going to Bayou, there were people praying for me. Some of my friends from college were part of the Bayou staff, but some of them were just praying for me as a future attendant and they never even met me. I paid it forward by praying for them and future retreaters myself. I think the best thing I can say about Bayou Awakening is that I found a whole new set of friends. With my college friends moving across the country, getting jobs, or getting married, the most I ever talk to them is on Facebook. Although I don’t see my new set of friends every day, I can at least see them outside of the internet once a month at least. But more importantly, like my college friends, they keep me growing in my faith. A few months later, I would find out just how amazing my friends can be. But that’s another story. This statement applies to today’s gospel because it’s a story Catholics know all too well: The Annunciation. It’s read a lot of times, mostly during a Marian feast day. And if any of you went to Catholic School, you may have prayed The Angelus. The Angelus is the Annunication in prayer form. As a kid, I hated praying the Angelus because it was prayed right before lunch, when my stomach was growling and my patience was about the size of a mustard seed. It felt like it went on forever, when in reality it was only a few minutes. But nowadays, I have grown an appreciation for it because I know the context of the prayer. In a way, I compare this experience to The Sound of Music, one of my favorite musicals. Many people grew up with the songs without knowing where the songs came from and some people probably hate these songs for being so overplayed in childhood. However, I was introduced to The Sound of Music at a young age. I used to have the movie on video and would watch it every now and then. By knowing the context of the songs, I was able to appreciate them more. In a way The Angelus prayer is like The Sound of Music. For me, I had to understand the context of the prayer in order to understand the prayer itself. My favorite song from that musical was “Edelweiss,” one of the quieter songs amongst a long list of showstopping catchy numbers. One part of The Angelus that stands out is “And the Word was made flesh and dwelt amongst us.” It’s the only part of the prayer that takes its verse from the Gospel of John instead of the Gospel of Luke. And it shows us Jesus’s origin story. Through Mary’s “Yes,” He was conceived. And she, and every generation since, has been blessed by Him forever. One new thing that came to my life in 2014 was this beautiful desk. Because my brother was moving to an unfurnished apartment, the desk I’ve been using for the longest time was passed to him. That meant buying a new desk for me. I love the color of this desk and that its simple design turned out to be the most efficient. I would add more things to this desk later on. 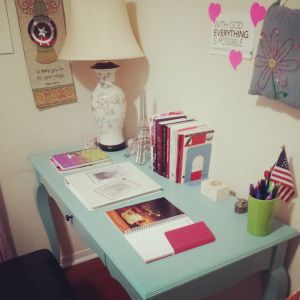 But what I love most about this desk is the fact that I use it whenever I write in my journal. And believe me when I say that I had a lot to journal about this month. I did a lot of reading, I hung out with my friends a couple of times, and watched the new season of Doctor Who. But the best was yet to come. Specifically, the next few months. Today is Pope Francis’s birthday. And something people forget about birthdays is that it’s not only the day you were born, but more often than not the day when you are given a name. I have been known by many names in my life. I was born Ann Mary Monique Sandil Ocampo. Later on, I insisted on being called by my middle name so I wouldn’t be addressed as “Mary Ann.” In high school, I was called “Mi-chan” by my best friend, “Lady” by my guy friends, and “DJ Dizzy” whenever I was on the morning announcements. But I also dealt with my fair share of name calling. 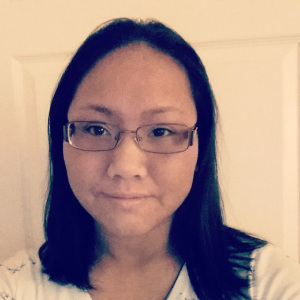 A high school bully called me “Momo” and “Snaggletooth.” One classmate in college flirted with me a lot and called me “babe” or “baby” at least once. An absent minded professor kept calling me “Michelle.” Someone who I thought was friend wanted me to change my name altogether so that I could start a new life with them. But now that I’m out of college, I am back to being regular Monique Ocampo. And I wouldn’t have it any other way. Why is the name we call ourselves by so important? According to Aquinas, the name of a thing says something about the thing itself. It’s like how St. Peter the Apostle’s name meant “rock” as an analogy to Peter being the foundation of the church as well as to Peter’s headstrong personality. Names can be meaningful by the definition behind the name or they can honor a person by that same name. When you change your name, you change a part of yourself. Some people change their names to take on a new identity, either to stand out or blend in or mark a significant change in their lives. Sometimes name changes are part of a coming of age ritual such as the sacrament of Confirmation where most young adults choose a Confirmation name or when religious sisters change their name as they take on their final vows. So why do popes change their names? It started with Pope John II in 533, who originally had the name Mercurius. He felt it inappropriate for a pope to have the name of a Roman god. Nowadays, popes have changed their names to honor their predecessors, a family member, or a saint they have a strong devotion to. In the case of Pope Francis, he chose the name after a friend in the conclave told him to remember the poor when he takes on the papacy. And even though I’ve called popes by nicknames (JP2 and Papa B), I haven’t found the right nickname for Pope Francis. But maybe for now I don’t need one. For now, just calling him “Pope Francis” is enough. 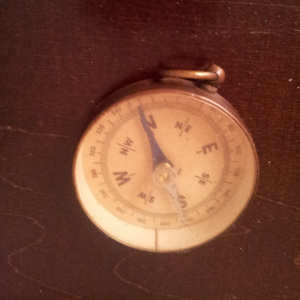 This compass has a lot of sentimental value on top of it being an antique. It used to belong to a family friend who fought in World War 2. But I also had this compass with me during my first Awakening retreat. To me, it symbolized my life taking off in a new direction. My journey in 2014 was a lot more interior than exterior. It wasn’t until July that I realized that. I spent the year looking for exterior changes when God was changing me on the inside. I hadn’t moved anywhere or started any sort of new job. But I did go out to the movies with friends. I even made new friends and got asked to give a talk at the upcoming retreat I was volunteering for. And whenever unexpected circumstances arose, I was able to deal with those things better. I acknowledged the fear I felt about the change and made the conscious decision to let go of whatever I couldn’t control. Sometimes I would talk things over with a friend, but otherwise, I was able to deal with my problems on my own. It’s definitely a long way from having an anxiety attack over an uncertain future, that much I know for sure. One of my favorite movies to watch this time of year is It’s a Wonderful Life. But I’ll tell you a secret: I really cringe at the part where George Bailey sees what his life would be like if he was never born. Not only because I find the fact that Mary’s worst case scenario is that she’s an old maid, but because I tend to get uncomfortable at the sight of angst. I know that conflict is what drives a story, but something I don’t like is a story that drags out the drama at the expense of everyone acting completely out of character or not communicating like actual people. Think of the contrived drama of soap operas. Yep. We’re halfway there. Living on a prayer. But it’s a little different from the halfway point of Lent. If the halfway point of Lent is like the halfway point of a long journey, the halfway point of Advent is like a little rest stop on a short road trip. (I’m biased because Texas has Buc-ees which is the king of rest stops, but please bear with me!) You drop in, get some food and drinks, freshen up, and get back to your trip. Some people complain about the fact that Mr. Potter never got his comeuppance at the end of It’s a Wonderful Life. But I like the fact that the movie ends with that loose end dangling because there’s still a sense of hope that things will turn around. George Bailey learns that he made a difference and learns his own worth in the world. The police drop the charges and there will probably be a more proper investigation later on. Mr. Potter may not get his comeuppance in the movie, but I like to think that he will eventually. The point of the ending is that George Bailey is halfway out of the dark. And in this third week of Advent, we cross over that same halfway point. Today is Taylor Swift’s birthday. Little known fact: Taylor Swift is exactly one month older than me. She was born December 13, 1989. I was born on January 13, 1990. This isn’t the first time I talked about Taylor Swift on this blog and it probably won’t be my last. Here are the Top 13 Reasons Why I Love Taylor Swift. Why Top 13? Because 13 is her lucky number (as well as mine). She’s a fangirl. She loves cats and watches shows like Gray’s Anatomy and Law and Order: SVU. (I still remember my Law and Order phase.) And now she has a tumblr. But I really wish she could delve into tumblr’s geeky side and get into the craziness that is SuperWhoLock. She knows how to turn a bad situation around. Back when Taylor performed with Stevie Nicks at the Grammy’s, her live performance was less than stellar. One particular critic was particularly scathing. But instead of giving up, she wrote a song. And then she won a Grammy two years later for that very song. And she performed that very song at the Grammy’s. Her secret messages. I love the secret messages. Each message told a story underneath the song it came from. 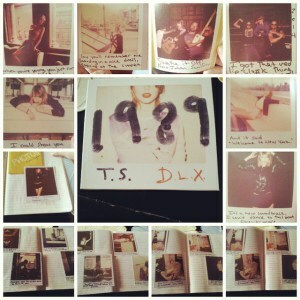 But by far 1989 has the best hidden messages because for the first time, they tell a story of their own. The specific lyrics. Taylor is a master storyteller, plain and simple. And whenever I listen to her songs, I imagine a story in my head. Even the very pop-sounding “Shake It Off” tells a story in spite of the lyrics being less specific. Her fashion sense. Taylor is a girly girl and makes no apologies for it. I love that her outfits never tend towards the stripperific (excluding the most recent Victoria’s Secret concert). She dresses smartly and sensibly, but it’s never boring or trashy. She loves her fans. She always goes out of her way to make sure that each fan that shows up at her concerts gets a small moment with her. That being said, why are the tickets for the 1989 tour so gosh darn expensive?! She’s smart about money. Expensive tickets aside, Taylor has some business savvy. Her parents both work in the financial industry, after all. By removing her music from Spotify, it prompted fans to buy her album in its physical form. Taylor is currently the only artist of 2014 whose album hit platinum. Try beating that, Beyonce! She always represented women’s empowerment, even before she took on the label of feminist. She’s one of the highest paid singers in the industry. She knows what she wants and isn’t afraid to get it. She stands up for herself and isn’t afraid to call people out on their actions. She’s not afraid to try new things. Her songs were genre-breaking, going beyond country and pop. Not to mention deciding to go full pop after 4 albums of being “country-pop.” She took a huge risk in moving to New York City and embracing this new image, but it paid off. She learns from her mistakes. In spite of what the media says, many of Taylor’s songs actually apologize for whatever she did. She failed so many times in love, but learned something from each heartbreak. And now she embraces the single life and focuses on making good friendships.